(KGTV) – A new study shows renting a one-bedroom apartment in San Diego costs nearly $400 less per month than paying rent on a smaller studio apartment. A Zillow/HotPads analysis shows the median rent on a studio apartment in San Diego -- with a median size of 470 square feet -- is $2,260 per month. In comparison, the median rent on a one-bedroom apartment in San Diego -- at a median size of 668 square feet -- is $1,865 per month. The U.S. median rent for studio apartments -- with a median size of 500 square feet -- is $1,385. For one-bedroom apartments with a median size of 730 square feet, the U.S. median rent is $125 less at $1,260. The largest differences in median studio apartment rent versus median one-bedroom rent are in Los Angeles and San Francisco, the study found. In Los Angeles, renters pay $1,650 more for a studio than a one-bedroom apartment. San Francisco renters pay $1,405 more for a studio apartment compared to a one-bedroom. The median rent for studios in LA is $3,800, at median of 500 square feet; the median rent for San Francisco studios, at median 450 square feet, is $3,920. 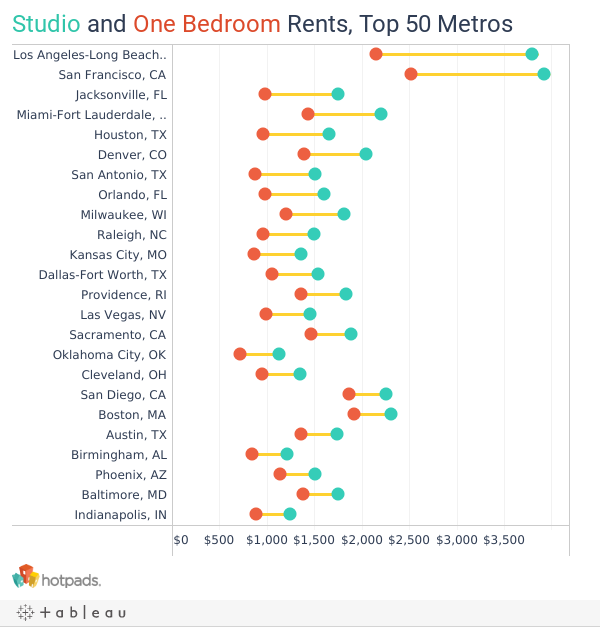 According to the study, the median rent for a studio apartment is higher than the median rent for a one-bedroom unit in 45 of the country’s largest metro areas. According to the report , the price difference seems “counterintuitive,” as one-bedroom units are typically larger than studios. However, the report shows studios in the markets studied tend to be closer to major job centers and desirable urban areas. Based on those factors, studios can command higher rental prices.